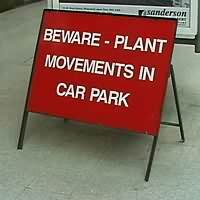  British signs We saw them whilst vacationing but couldn't comprehend them.  Chinglish Funny signs we spotted in Beijing. Our guide said their interpreters aren't always the best.  Travel blog Read a day-by-day account of our monthlong cruise from Singapore to Beijing.  Asia cruise photos Here are the photos of that terrific cruise.  River cruise Photos from our Viking trip: Amsterdam to Budapest.  Panama Cruise Photos from our cruise through the Panama Canal.  Alaska Cruise A compilation of photos from our cruises to Alaska.  TechTV I've posted some of the stories on which I reported, including some video clips. at the train station in Newcastle. And Dan Brekke provided the translation.